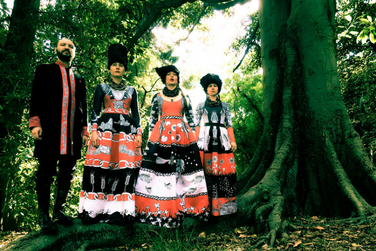 Like the band, the name DakhaBrakha is original, and authentic at the same time. Meaning “give/take” in old Ukrainian, DakhaBrakha presents fundamental elements of Ukrainian “ethnic chaos,” bending genres with new music influenced by traditions from across the globe. This quartet from Kiev’s dramatic show is filled with explosive harmonies and thrilling vocal effects. While deeply rooted in Ukrainian culture, the band’s compositions are influenced by sounds from Arabic, African, Russian and Australian traditions.